It's no wonder coffee and wine attract some of the same fans: both beverages are products of climate, care, and curation, and both tell fascinating stories with their flavors. In this story, coffee meets wine, falls in love, and brews happily ever after. We couldn't wait to share it with you! 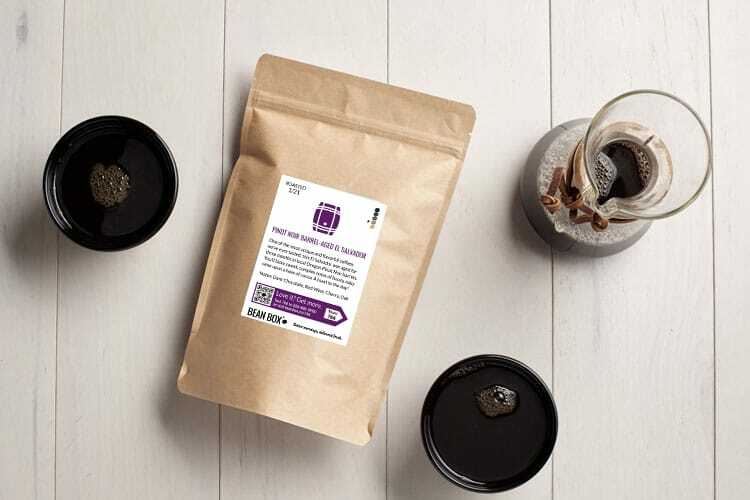 To prepare this coffee, unroasted beans from El Salvador are aged three months in the same oak barrels that aged local Oregon Pinot Noir for over a year. The beans are removed and roasted, resulting in a complex cup of layered flavors that feels playful, sophisticated, and utterly unique. Look for a sweet, balanced interplay of coffee and wine flavors. The wine barrels add a depth to the cup, but they don't dominate it; instead, the sweet, fermenty red grapes provide a boozy complement to a mild, creamy El Salvadoran coffee with notes of cocoa and citrus zest. Cheers to the morning! "This was an oddly great coffee. I'm not a wine drinker, so I have to say that I noticed the dark red/purple fruit tones/flavors. Loved the dark chocolate woody flavor, and the zingy red/purple fruit notes. Very different, very good." "A kind of unusual but certainly interesting coffee. I did not get much chocolate but did get the cherry and wine flavors. The wine notes, though, were a little too overpowering for me. I blended it with a Sumatra and it was very delicious. Brewed french press." "Nice one! The wine/grape notes are delicate and do not take over the chocolate coffee flavor. One of my faves. " "This coffee is an absolute treat! As soon as I opened the bag I got a whiff wine. As the coffee cools, the wine taste becomes more noticeable. Smooth, fruity, low acidity." "Wow! It really does have a wine taste and after feel. A very unique coffee worth trying." "A very unique aroma, definitely smells of wine. Coffee has strong fruit notes but is fairly smooth as well. Very flavorful coffee with an unusual twist. Not one of our favorite coffeess but very good. " "I was really looking forward to trying this roast, but have to say I was a little disappointed. This is a good medium roast coffee, but I was expecting better. It just might be the wine tasting notes that I am not used to. I think I’ll stick with the more traditional roasts." "Loved this one. Dark cherry flavor with dark chocolate and after taste of red/purple fruit tones that must be the wine finish." "Holy FLAVOR! This is the first time I reserved a Top Shelf, and I am so happy I did. This coffee is bursting with flavor. The first note I noticed right away was root beer. Then a cherry flavor. It has a semi-sweet, tangy flavor. If you love flavorful coffee, I suggest giving this one try!"